By my reckoning French cyclist Alexis Gougeard has taken the KoM competition. Britain's Mark Cavendish is keeping himself nicely hidden from the elements right in the middle of his Dimension Data team-mates. How much energy might that conserve for the final sprint...? Not good news for Team Sunweb rider Michael Matthews. The Australian has dropped from the lead group to the back of the peloton and it looks as though he's having to change his wheel after being involved in a crash. British rider Owain Doull from Team Sky is also up there. Alexander Kristoff may not be here but his Katusha Alpecin teammate Nathan Haas is looking strong in the lead group which now stands at six riders. Manuele Boare and Valerio Agnoli remain from the original breakaway. There's about an hour of racing left here. We've still got a breakaway group, followed by a first chase group of about 25 riders and then the main peloton, who are 60 seconds down on the leaders. This looks likely to end in a sprint up the Mall. It looks as though a few riders are struggling to hold on at the back of the peloton with the gusty conditions probably not helping at all. Meanwhile Britain's Mark Cavendish is looking relatively comfortable sat with his Dimension Data team-mates near the head of the peloton. Time to go all in? One last KoM to come and it's the iconic Box Hill. The race leaders will want to stay together to hold off the sprint trains. Now then. This is getting interesting at the front of the race. The breakaway has been caught by a group containing Nathan Haas and Michael Matthews so the lead group has swelled to nine. BBC Breakfast's Louise Minchin also took part in the Ride 100 earlier. "I didn't think I could walk. I've had a mud facial and a shower - the weather was brutal out there," she told the BBC. "But it was an amazing atmosphere, it's been great fun. It's a long way but all the people that came out in the rain to support us was fantastic." That's the penultimate KoM done and dusted with Manuele Boaro (Bahrain-Merida) ahead of Alexis Gougeard (AG2RLM Pro Cycling) and Aaron Verwilst (Team SVB). By my reckoning Gougeard now tops the KoM standings with 21 points with Aaron Verwilst second on 18 points. Mitchelton-Scott's Caleb Ewan may have won stages at the Giro d'Italia and Vuelta a Espana in the past but he won't win today. 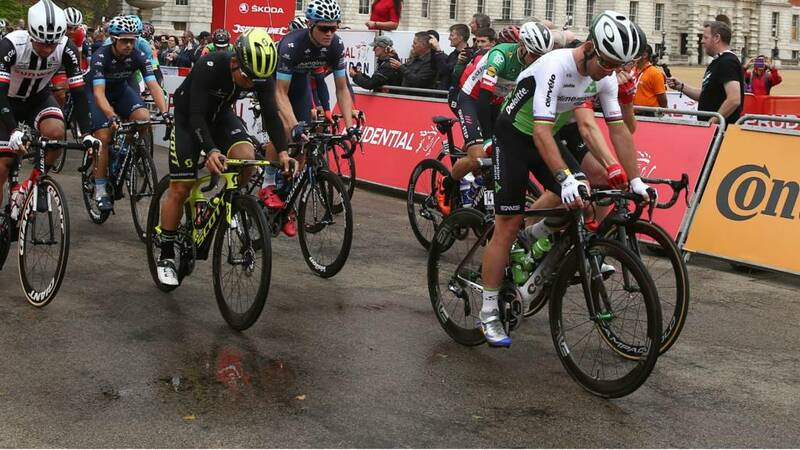 The Australian sprinter has abandoned after being involved in the breakaway earlier on. That's one less rival for Mark Cavendish to worry about on the Mall. We're on the penultimate KoM climb as Michael Matthews (Team Sunweb) and Jay McCarthy (Bora Hansgrohe) head a small group of riders to open up a 30 second gap from the main peloton in pursuit of the breakaway. I think Mark Cavendish has a shout today, definitely. We saw him at Tour de France not necessarily in his peak condition, so we're hoping for a little bit more. The hope was there at the Tour de France but I just don't think he has raced enough this year with all the injuries he's had. He's had some bad crashes. Manuele Boaro (Bahrain-Merida) takes the third sprint of the day as the peloton reduce the gap to the breakaway group to around a minute. There'll be in sight soon. Conditions definitely aren't improving. The wind seems to be getting up as the breakaway hold on to a 1'22 advantage over the peloton. We made it! 100 miles done and dusted through the wind and rain. Chapeau to all the participants, it's been a great experience with an amazing vibe throughout the journey. Just got another eight miles to the hotel now! Earlier today, 24,000 amateur riders took part in the RideLondon-Surrey Ride 100. The 100-mile route was gruelling and the rain didn't help. BBC Sport's Anna Thompson took part, alongside her other-half Stewart. How did they do...? The third KoM of the day brings the same top two as the second.